Who needs to pay hundreds of dollars on hotels, plane tickets, gas, parking, and registration fees? Location: Your living room, or study, or bedroom. We'll even let you attend from your bathroom, just so long as you keep the specifics to yourself! Homecon is CruinndracFarms' way of giving those who don't/can't attend conventions a chance to experience the fun and excitement of picking their own wyrm eggs! It saves us, and you, on travel/convention expenses, by selling to you online. It also gives international handlers, and those who don't/can't attend conventions a chance to still pick their eggs the same way as people do at cons, with all the craziness that goes along with it. We will be offering Tea-cup Wyrms online, blind-draw, over the course of the convention. Each day, at listed times we will post threads here on the forums allowing people to put their name in to claim a slot in line. Spots will be decided by RNG from there. Each person may claim only one slot per stream. You may NOT claim a slot for someone else. If you claim a slot, you are expected to attend the corresponding stream to pick your egg. If you don't show up, then you will lose your slot. Well, Homecon is a celebration of the community. Besides our own sales, we also invite the artists within our community to share/sell their Wyrm-related items. 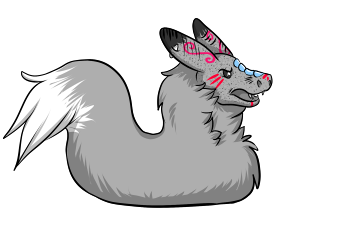 Want to stream Wyrm-art commissions during Homecon? Great! Have some Wyrm collars or other accessories you'd like to sell? Awesome. We have virtual 'Dealer Tables' as well. - Art/sales should be streamed. This is to keep an interactive, 'convention' type experience. You choose your times. If possible please post stream times ahead of time so we can add you to the convention schedule! Each artist should have their own thread to keep track of sales. - Your sales are your responsibility. Exchanging of funds, applicable taxes, etc. are up to individual sellers. - Please keep all items sold of a PG/Family-friendly nature. - We cannot guarantee attendance to your streams, or sales. Sorry! - As of last year we are instituting a Dealer Table fee. This is in the form of a $5 donation to any reputable cat/dog charity of your choice. A screenshot of the donation MUST be sent to D (Hopefulmonster) once your table is approved. Further information on this can be found on the dealer table application thread. As a clarification, because I was asked. During HomeCon, There will be 2 RNG lists. The 1st list is newbies with no wyrms or if you have NOT gotten to pull a wyrm yet when you comment with egg pull interest. The 2nd list will be those who have pulled at least 1 wyrm for the weekend. This is to give everyone a fair chance at getting at LEAST 1 wyrm pull for the weekend. PLEASE NOTE!!! If you *pass* on your chance to pull a wyrm because you did not care for the egg options, this does NOT count as qualifying for the 1st list. If your turn comes up and you CHOSE not to pull an egg, that is your choice. NEWBIE QUALIFICATION - A potential Handler with 0 wyrms, who has joined the forums AT LEAST 3 days before start of HomeCon (Friday). Any new handlers signing up for forum accounts less than 3 days before the con will have their names put in the regular draws. This is to prevent friends of existing Handlers from signing up at the last minute to get extra pulls for their friends. WARNING!! If we find out about any Handlers using friends to get extra egg pulls, both parties will be Blacklisted for the duration of HomeCon and recieve a 1st Strike. Any wyrms pulled will be put back into available population. Don't try to cheat the system, play fair, and be excellent to each other!